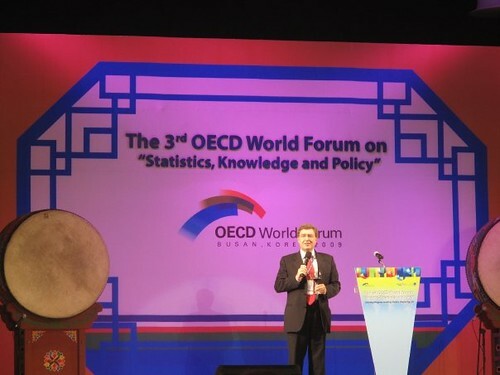 The OECD World Forum on “Statistics, Knowledge and Policy” was held in Busan, Korea on 27-30 October 2009. This OECD World Forum focused on Charting Progress, Building Visions, Improving Life and attracted high level participants with a mixture of politicians and policy makers, opinion leaders, Nobel laureates, statisticians, academics, journalists and representatives of civil society from many countries. The 3rd OECD World Forum, was organised by the OECD and the Government of Korea (Korean National Statistical Office). The Forum focused on three major questions: What does progress mean for our societies? ; What are the new paradigms to measure progress? ; and How can there be better policies within these new paradigms to foster the progress of our societies? The economic crisis made these questions even more important. The forum gathered close to 2000 participants from more than 100 countries including; politicians and policy makers, opinion leaders, Nobel laureates, statisticians, academics, journalists and representatives of civil society. We would like to sincerely thank all the speakers and participants who attended this successful event. The working sessions confirmed the relevance and potential policy impact of the many on-going initiatives over the globe aimed at enhancing frameworks, processes, methods and tools for measuring and fostering the progress of societies.The conclusions of the 3rd World Forum marked the beginning of a new challenging and intense working phase. Read more about the conclusions of the 3rd OECD World Forum. Please click here to view the speaker biographies, shown in the order that they appear in the agenda. The 3rd World Forum was organised in the context of the OECD-hosted Global Project on “Measuring the Progress of Societies”, launched to implement the Istanbul Declaration, which affirmed the need to measure and foster the progress of societies, and was signed by the United Nations, the European Commission, the Organisation of the Islamic Conference, the OECD and the World Bank, among others at the end of the 2nd OECD World Forum. The International Exhibition at the OECD 3rd World Forum focused on issues related to "Charting Progress, Building Visions, Improving Life". The scope included new technologies for visualising statistics, initiatives to measure and foster quality of life at local and national levels, eco-friendly green technology and with a particular focus on promoting green growth and social cohesion. The Exhibition held 57 booths (stands) in total, 23 were International Exhibitor booths and 34 Korean Exhibitor booths. At the closing of the 3rd OECD World Forum, Pier-Carlo Padoan, Deputy Secretary-General of the OECD presented the OECD RoadMap . It was announced and highlights OECD's policy, strategy and commitments to measure and foster well-being and progress "Measuring and fostering well-being and progress: the OECD roadmap". 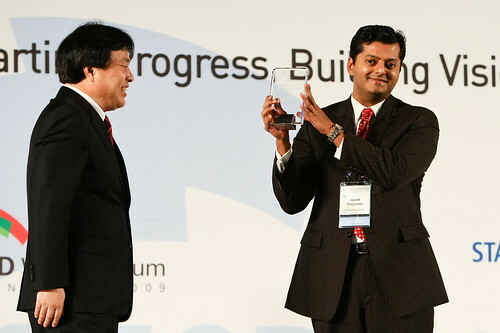 Wikiprogress was launched at the 3rd OECD World Forum 2009 (Korea). The site is now live and seeking contributions from the progress community. Find it now! The awards panel was made up of a mixture of people from different regions of the world and from various organisations. They reviewed, discussed and choose the winners, as well as selecting the categories.